Nathalie Chikhi is the queen of experimentation. She’s been making art everywhere she goes and no material is off bounds in her creations. 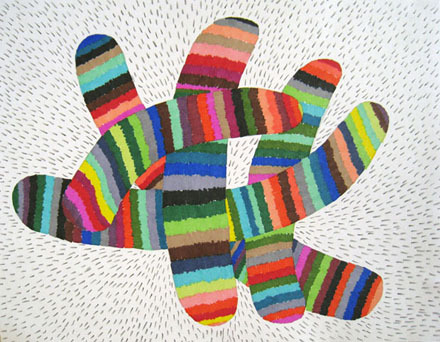 Although I am very much taken by her drawings and colorful explorations (particularly Pixels, which is made up of ice-cream sticks!) 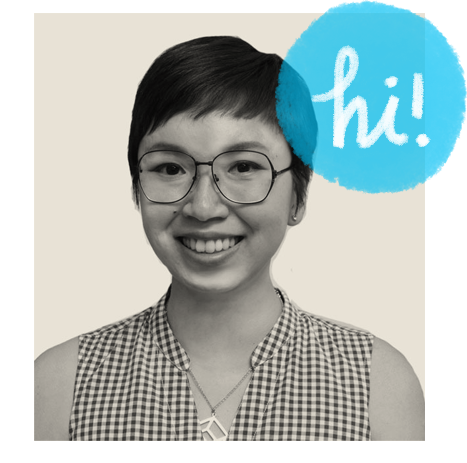 she has experimented with paper, sculpture, bamboo and even messed around with toy cars — I kid you not! Read on for a personal one-on-one with Nathalie and you’ll soon be inspired to look around for things to make too! I was born and grew up in Quimper, Brittany. I went to art school over there, the only thing I knew is that I wanted to create some stuffs. During my childhood, I was drawing on the last page of my notebook and did some murals in my bedroom. At school, I was better in drawing that anything else. Where do you live? What stands out about living where you are, and what is your daily schedule like? I am primary based in Orlando, Florida where I have my home space studio. But I also travel extensively across USA. I have created many pieces in temporary domestic space or hotel rooms. I want to keep doing new artwork even if I am out of my studio. I use the space as a rule like a format of paper or a limited numbers of colors. This limitation of space helps me to experiment with various materials. For example, the series blizzard was done with permanent markers on paper. 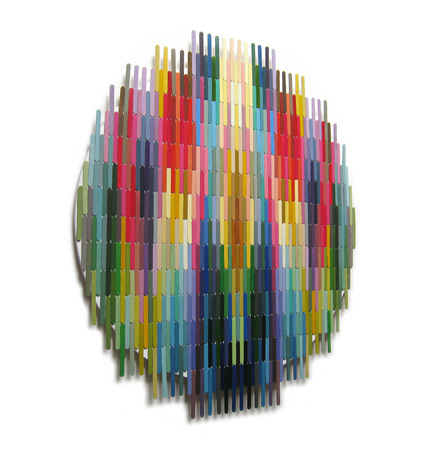 The series Pixels started in a domestic space, using wood sticks painted in acrylic and continue in my art studio. This process is part of my art practice. What is great with Florida is the weather. I have also my friends there. Orlando is a growing city, with many things to do, a lot of opportunities for artists and close to Miami. I am very much 9:00am-10:00pm. I practice art daily, alternating the creation of new artworks with marketing tasks/website updates/inventorying/reading art blogs (and so on). How did you get your start in making art? During my time in France, beside my graphic design job, I kept connected to the art world going to openings and art conferences or taking art classes. I have been invited by BD4D to create a flash motion. I did some videos with a creative group of designers which have been showcased at the Centre Pompidou and at the Biennial of Valencia in Spain. I did few paintings and sold some. But let’s say, coming in the USA has been a revelation of what I really want to do. I decided to build a strong portfolio back in 2005 after I visited New York for the first time. I was really blown away by all the good art over there. It was amazing! Right after NY, I moved to South California where I really started to paint-draw daily. 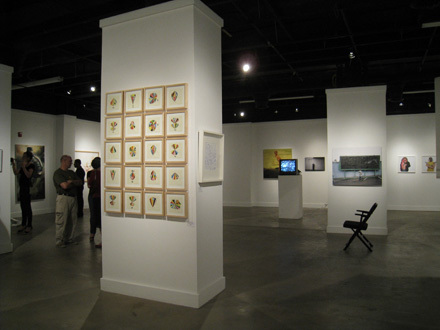 I found out the series Mechanic and showed my work metamorphosis at the Art Center of Huntington Beach. Back in France, I continued to practice and organized my shows; one in a shop of contemporary furniture in Paris and another one in local cafe in Brittany. It was interesting to confront my art with people familiar or unfamiliar with art. At the same time, I did some textile monsters and illustrations but I felt more attracted by abstract textile works like ovolites. 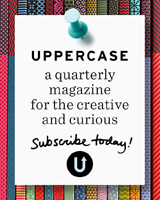 Could you tell us more about your thought process when you start a piece? Usually, some new ideas appear in my mind (pretty clearly) when I am taking a shower or fall asleep or when I am relaxing. Depending on my current activity, I took my sketchbook or any piece of paper and draw some first sketches. Sometimes, I use my computer software (illustrator) to make my color researches. For example, my last series titled pixels started like that: I got the idea one evening in my bed. I felt so much excited that I had to wake up again and draw my ideas. The next day, I went to shop my materials and made the color researches using illustrator before to start. Most of the time, I like to create the artwork as soon as possible in order to keep the spirit of the work alive. Share with us about your current series/collection. My last series is pixels (mixed-media). 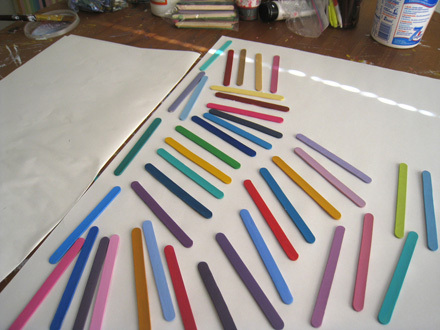 As I was looking for a process to experiment with colors, I got this idea to use wood sticks. I wanted to use some existing shapes as simple as possible, already manufactured that I could paint and organized in pattern. Tones and compositions are infinite. I started with pixels #1, which is composed of two symmetrical rectangular boards. It was followed by pixels #2, a set of triangular format. Later, I did a volume, pixels #3bis. For this one, I wanted to allow me more freedom. The wood sticks were colored and glued randomly. pixels #3 is a set of circular twins, smaller in size to compare with pixels #8 and pixels #10. This last one is definitely the biggest of the series. Another one, similar in size will follow in the next weeks. Right now, I am also working on some pixels on paper. Some others ideas are ready to be done. They are some variation in volume/shape and color arrangement. Each new project is a favorite one but I have a preference for my sculptures (embroglio, 2008 and emptiness sculpture, 2009), installations (intrinsèque-intrinsic, 2008), mixed media works (pixels, 2010) and pyramids (21 pyramids, 2008 and 9 pyramids, 2009). The idea of emptiness, appeared one day in my mind clearly. As I was working full-time in my day-job, I quickly made a vector graphics of my vision. Few times later, I was pushed to make it real using graphite. The process was long and in the same time exciting. 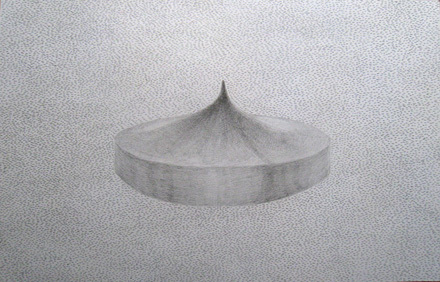 While watching at the completed drawing, I felt peaceful; the object seems to float, in a state of levitation. One year later, I made Emptiness sculpture, the 3D version of the series. My plan is to make a bronze of it. Embroglio has been inspired at first by the concept of complexity and interlaced things. This piece was to be 3D and finally it ended 2D. Maybe, it was an answer to some complex life situations. The sculpture shows that something started from a central point to go to many directions. The knots could be some thinking steps, waiting time or choices that were done. At the end, the life is somehow a thread of choices that draw various ways. You took one way but you could have chosen another one. 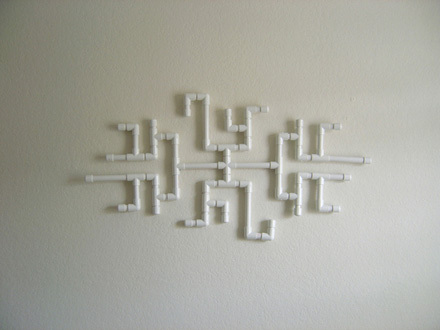 To create this piece, I decided to use building materials, some white plastic pipes, keeping the red inscriptions visible. While I was creating intrinsic, two memories pop up. It reminded me the tumbleweeds in some Hitchcock’s movies and some real ones that I saw while crossing, at night, by car, the Death Valley’s desert. Both of these situations were the subject of anxiety, unexpected events and darkness. At the opposite, after I have completed the installation, I noticed that all my fears disappeared and replaced by a feeling of serenity. During the process of making this artwork, I was interested by using materials-objects of our daily life. 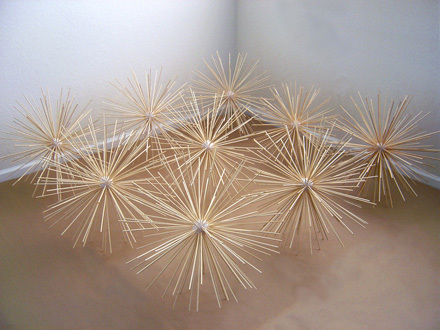 This artwork has been created in my domestic space in Florida, using bamboo sticks. 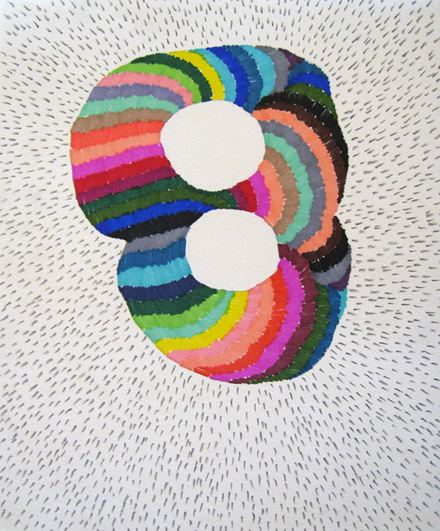 This work is composed of 9 elements organized in a square space. The Pyramids series started back in 2007. It seems to be an infinite collection because of the endless possibility of colors and shapes. I do a new collection every year. These pyramids can be stacked, single, in group and reversed. I play with them, draw and duplicate them into infinity. Each drawing is unique, with its own proportion and tones. My key works are automatic, pyramids, infinity, abstraction and quite a bit of obsession. 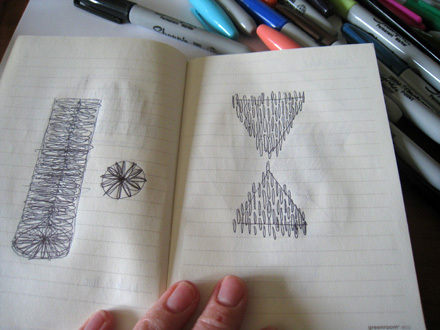 Do you keep a journal/sketchbook, and would you mind if we had a sneak peek? 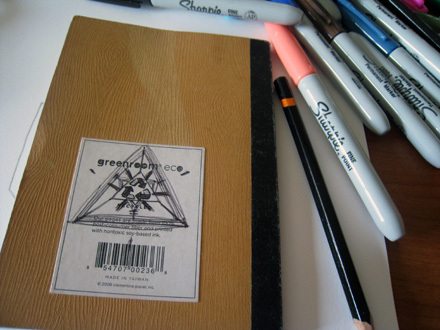 I keep a pocket-size sketchbook all the time in my shoulder bag. Here few pictures. I also used some letter size paper to draw more detailed projects, later organized within a folder for future development. I also draw some 3D views of installation using illustrator. Would you care to share your studio space as well? Here it is. 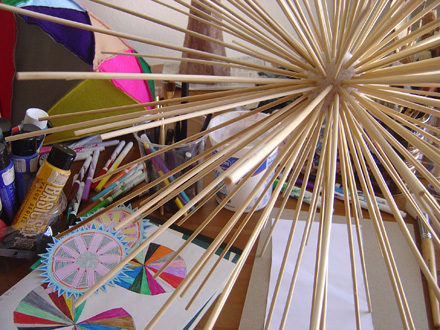 It is an active space, I mean things, and materials appear and disappear in the studio. When I do a messy work, I put some protective ‘rugs’ on the floor and some plastic transparent one on the wall. I have a dedicated surface of work for my clean tasks computer-printer-scanner and a dirty one for my experimental works. All the toxic tasks are done outdoor. One the work is inventoried; I put it in a box dated per year. All the boxes go in the room’s storage. Right now, I am looking for an art space studio in the Orlando area. My works are an exploration of what it is inside of me. Somewhat it is a reflection of my life’s experiences and feelings. I love many artists, designers and illustrators but I have a specific interest for the works of Louise Bourgeois (sculptures), Damien Hirst (risk-taker, multidisciplinary), Kader Attia (installations) and Tracy Emin (textiles installations). In art school, my favorite’s artists were Salvador Dali, Claude Cahun and Jean-Michel Basquiat. At this time, I was very much into the surrealist’s movement. Now, I am more attracted by minimalist and conceptualist’s works. I just started a blog called botanicbotanic as a visual dictionary: http://botanicbotanic.blogspot.com . Before that, I used to twit http://twitter.com/nathaliechikhi my discoveries. The support of my husband, the kind words of collectors & artists, interviews and exhibitions keep me motivated. Also, every event that helps me to get closer from my goal is a motivation to complete new works. I love to explore & experiment so I don’t have one favorite tool specifically. Now, they are graphite, permanent markers, acrylic painting, charcoal, paper, textile, wood, hardware materials and domestic supplies. Not yet, but I intend to be a full-time artist within the next 5 years. Since 2010, I do art & design full-time. My schedule is balance between freelance design projects and making artworks. Recently, I have designed the full look and feel for some mobile phone applications. I worked with customers completely remotely since 2008. I also want to say, that last year, I got a full-time job, for 2 reasons: speak English and start my own business. I was working for a franchise of pizzas. My afternoon and evening were dedicated to make art. So, today, I welcome various opportunities of design projects and art collaborations. I don’t know what will come tomorrow; what I do today, might lead to my goals. What advice would you like to give people who are interested in being an artist full-time? As an aspiring full-time artist, I don’t have (yet) any specific advice. I study the path of successful artists. I read resumes, books, watch videos, reviews, artist’s blog, visit art galleries & museums, Google everything I don’t know, visit openings studios. I have set up my goals to know where I am going. Be happy! Create daily in a constantly manner. I would like to have my own art space studio with a concrete floor and huge windows. 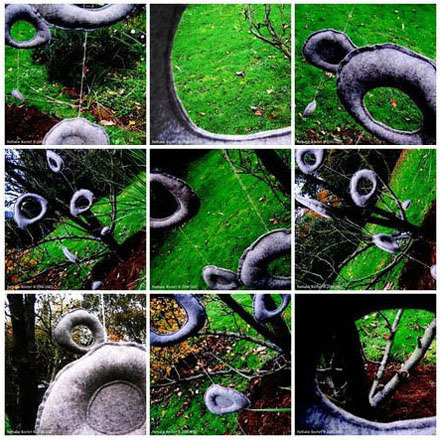 I would love to do more sculptures, installations and huge paintings. Later this year, I wish to make a bronze of emptiness. I will be happy to have more group shows & a 2 person-solo exhibition. I wish that I will be a full-time artist working with assistants to help me create new works. I would love that my works generate some personal resonance to the viewer. I wish that some works can be seen as playful & bring some happiness. Tell us something random about yourself! 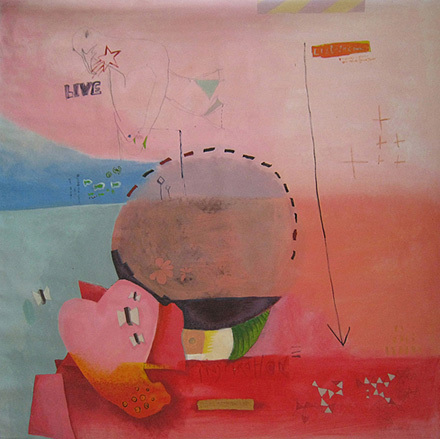 There is the viewer, the artist and between them, the work as a visual language. Oh my! I love it all! It’s so rare to see an artist who can successfully create amazing art in so many different mediums. I can’t even decide which series I like best, they’re all incredible.